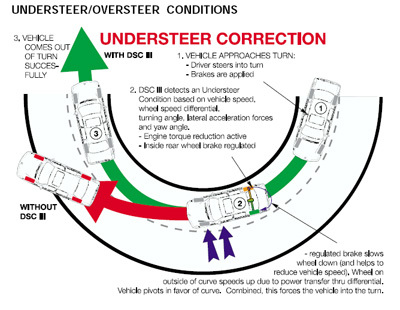 Understeer: The car does not turn enough and leaves the road. Auto Gearhead: Understeer is vehicle dynamics terms used to describe the sensitivity of a vehicle to steering. 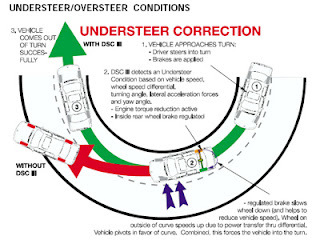 Understeer is what occurs when a car steers less than, or 'under' the amount commanded by the driver. Automotive engineers define understeer based on changes in steering angle associated with changes in lateral acceleration over a sequence of steady-state circular turning tests. Understeer occurs when traction is lost at the front wheels while cornering, forcing you wide on a bend despite applying the correct steering angle. The potential harm of understeer is the car out off the road. But fortunately, this emergency situation is fairly easy to overcome. The point is to slow the vehicle so that traction can be returned. To avoiding understeer you can drive as smooth as you can, don't enter corners flat out, and accelerate as you exit, do not add a round steering wheel or brake, reduce round the steering wheel until the tire gripping again. The las is do not brake in a corner. The only exception to this is if you are using trail braking (late braking). In some situations on the track, it may be possible to get a better time by leaving your braking to the very last minute, forcing you to maintain braking into the turn. If this is the case, ensure most of the braking effort has been carried out in a straight line, and progressively release the brakes as you approach the apex. The resulting forward weight transfer can reduce understeer and improve 'turn in', however, it can also make the car more prone to oversteer. This is an advanced technique and should only be used once you are very confident with your car, the track and the conditions. Simple modifications to make a car less prone to understeer. Increase front down force (if aerodynamics fitted). A video from the AMG Driving Academy Performance, an explanation about Understeer and Oversteer. Thank you very much my friend for your visit, happy Wednesday. peace. Hugs Valter.